Ann Arbor (Informed Comment) – Some high school young men from a private Catholic school in Kentucky had been encouraged to attend an anti-abortion “March for Life” near the Lincoln Memorial in Washington D.C. on Friday. Nearby, Native Americans were rallying for their rights. 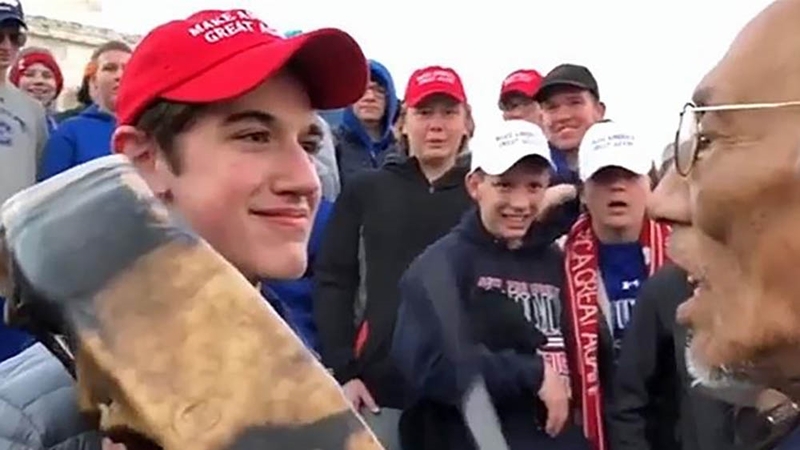 Vietnam Vet Nathan Phillips some a mean crowd of white teens in Trump’s red “Make America Great Again” caps harassing four African American young men. He was beating his drum and chanting, and came forward, drawing the attention of the young thugs, realizing the danger, he said. Tomorrow’s “base,” ensuring McConnell’s re-election in perpetuity. From a private catholic school - kind of explains it. Ignorance, evil, and religion seem to go together well. This is just one ugly scene from a country full of them. I appreciate Cole bringing to our attention - we wouldn’t have heard about it otherwise. It highlights the crass rudeness of young people raised on hatred, and the speed with which ‘hatred of the other’ is consuming (still) our country. This right here, is how bigotry is being spread, by parents raising their children to be exactly like them. Their parents are already coming to the defense of these kid’s actions. I’m all for defeating this hate, and one of the first steps is, impeachment of The First Hate Monger in the White House. In total agreement with your sentiments. Parents teach by example and omission of guidance. I went to a catholic school and did not learn to hate however I do not know what they are now teaching. This article was posted on THE GUARDIAN. That said, I do not wish to take credit away from Mr. Cole whose writing I appreciate and this on reads like a poem. Total Respect and Love to Nathan Phillips for standing fast(and others with him) in this storm of ignorant, empty soulless sea of hungry ghost young men. It is callous, deceitful, rife with hypocrisy, corruption, & other telling characterizations that parasitic exploitation by an Alliance supposedly meant to end homelessness promoting an excursion in the corrupt evil kleptocracy San Diego, CA, to further profit by promoting & exploiting socio-economic disparity, distortion, poverty & injustice. Among the agenda is support for illegal aliens. While the entire country was promoting blatant Bobbit scam & gullible people were duped yet systemic corruption in the Veteran’s Administration & city of San Diego, CA, along with complicit media indulged & suppressed exposure that I, an honorable USN retiree, was critically injured, forced onto the street & my property stolen, exploited by con artists, thieves, & kleptocrats; abandoned for months enduring injuries without treatment or assistance, realizing that callous hypocrites & evil people wanted me to die. City of San Diego, CA, an abusive kleptocracy, Veteran’s Administration as worse, that caused the injuries & evading accountability while parasitic exploitation has indulged their self at my expense & well-being. When it’s their self-serving convenience, politicronies, kleptocrats, corporateers, NGOs, & complicit media exploit military, indulge illegal alien invasion, & promote misinforming propaganda but suppress exposure & ignore reporting injury, injustice, disparity, & crime endured by an honorable USN retiree. Such exploitation applies to this military retiree; in my unfortunate experience with evil, corruption, & kleptocracy in San Diego, CA; transitioning into poverty & austerity amid crime & corruption while abusive negligent criminal individuals & parasitic organizations (Veteran’s Administration, city & county along with state cronies, fraudulent foundations, evasive NGOs, …) indulged at my health, well-being, & expense; enduring injury, injustice, rights violations, parasitic exploitation, negligence, fraud, theft, abuse, & harm without protection or exposure since suppressed & obscured by misinforming propaganda promoted via complicit media; considered a budget liability, physically harmed & exploited as my earned benefits & entitlements are heisted by kleptocrats & terrorist agents with my blood on their hands. All California reps ignored my requests for assistance, protection, & involvement during incidents of injury, crime, injustice, & growing disparity then indulged beside forced into homelessness & property stolen, still not provided deserved assistance & recovery, legal protection, or medical treatment for injuries & life-threatening complications. What philosophy & purpose promoting, protecting from what supposed external threat when indulging abuse, harm, injustice, disparity, crime & domestic terrorism? What purpose served when systemic corruption, kleptocracy, hypocrisy, & parasitic exploitation prevalent in San Diego, CA, that can injure, commit crime, rights violations, steal property, & force an honorable US Navy retiree into homelessness yet exposure suppressed & no protection provided? Systemic corruption indulged & suppressed exposure of abuses, fraud, crime, & neglect in Veteran’s Administration, city & county agencies, NGOs, fraudulent foundations, dubious non-profits, & other parasitic scams. Abuse & harm indulged by kleptocracy & systemic corruption, injuring & persecuting a citizen, wantonly violating rights by suppressing truth & evidence along with media exposure, then promoting misinforming propaganda along with fraud by manipulating records. Further crime & harassment, my vehicle sequentially vandalized, burglarized, then stolen but each crime was by kleptocracy & systemic corruption in San Diego, CA. Then fraud when altering reports & changing records to reflect I had committed those incidents to my own vehicle. Promoted Power for Peace & accepted the Oath upon entering honorable US Navy service, willing to fight terrorism from supposed external threats, resolve human rights violations, protect people from harm, but enduring injury, injustice, abuses, & rights violations while unprotected from crime, systemic corruption, persecution, kleptocracy, & domestic terrorism in my native country. Please try to use fewer words to describe exactly what you are attempting to share with us all. It comes over in such a jumble of words and phrases that it’s difficult to understand your concern. It’s a foregone conclusion that if a person believes in Donald Trump at all, they are among the least intelligent persons on historic record. That said - a person wearing a MAGA hat cannot be expected to say anything profound, accurate, intelligent, or even intelligible, …so there should be no surprise that near half of the voting population - accounting for many tens of millions of our finest of genetic accomplishments, should be every bit as wrong as the deity they worship is. I first read this on Al Jazeera. Catholic school students may face expulsion for their behaviour at Indigenous Peoples March in Washington. Looks like the cretins are also breeding. Sigh. Their actions are certainly against Life. Imagine this land and the First Nations if the racist invaders from England were stopped from landing. Instead the invaders were taught how to survive by the indigenes and were massacred for their efforts. The irony doesn’t register because it serves the dominant occupying culture. The Price of Empire is a worthwhile read. "...there is a price to empire. A grave and ruinous one. And that price has grown over the centuries - so high that now, it is not worth paying anymore.."
To be a great empire, you must also be a certain kind of culture, society, place— a people with a certain set of values, a certain kind of attitudes. You must cherish control and prize possession over humanity and empathy and wisdom. You must value brutal competition above all else — and train your children to be little warriors, basically, whether tossing them into seas, like Spartans, or making them do “active shooter drills.” You must be domineering and controlling and vengeful, feared, not loved — you must come to prize anger and rage as the only true or worthy emotions in life, not, say, intelligence gentleness, kindness, or happiness. The primary objective of your institutions, the aspiration of your best and brightest, must be subjugating others, instead of lifting them up — after all, empires are made of subjects, not equals. You must instill in people an admiration for violence — since empires are run with bullets, whether fired from drones or armies. Your science and art and so forth must be dedicated, fundamentally, to the proposition that somehow, you are the natural masters of the world which is your dominion — no matter how they claim to admire freedom and equality and truth. You cannot plan for any kind of long term good — your primary motive is simply to acquire, colonize, plunder, take the next possession. They are teaching the same thing they taught you, hypocrisy. When I was in grade school, and we would daily stand and say the pledge of allegiance, that was it. No one was attempting to indoctrinate or brainwash anyone. It was more of a process of making us aware of part of the culture we were being taught, no more. Nothing like what we see now at ball games, car races, and on military TV ads. With Vietnam there were choices some of us had to make. Those of us that were too young to think in patriot terms, had no deferments, were too honest to cheat a physical exam, and not quite scared enough to leave the country to avoid serving, stood up and served. Would I volunteer to protect the lives of Trump worshipers? Hell no. To protect their corrupt fathers that were bilking the public to earn an outrages living? Hell no. To satisfy the MIC, and all other 3 letter enterprises? Hell no. Not now anyway. I’ll protect my family and property alone if need be. But until the country returns to “a country”, and not just I, me-me, mine, they will have to find their own peace. Dear Spacecadet, I do understand the hypocrisy taught by religions. One of my biggest gripes it the fact that an infant is born with a black milk bottle sole and cannot enter the kingdom of heaven unless said infant is baptized in the name of christ. yah well the inquisition of the middle ages, the usurpation of all of north,central and south america in the name of the catholic church and on and on. My brother’s grandchildren attend catholic school and I assume are being taught exceptionalism for example, the first grand daughter reported that she did not want to attend dance class any longer because the other kids were not catholic. But in this instance I have hope for the kid because her parents are very loving and nowhere in her upbringing is she learning hate. Furthermore I believe that she will make her own decisions in life when the time comes. Secondly her reason for not attending dance class may be that she feels that she is different. I say this because she is very shy and reserved so I am thinking that this could change if she continues to have a variety of experiences which encourage her to be out and about. I believe it is important to foster and open mind even when considering forces which are know to be deleterious.